SAOTA exceeded once again their own talent and revealed a new and outstanding dream home in Plettenberg Bay, South Africa. The exquisite residence, called Plett 6541+2, combines gracefully the idyllic elegance of a sophisticated home with “a relaxing house on the beach” kind of design. The clients requested a six-bedroom house, overlooking the blue waters. 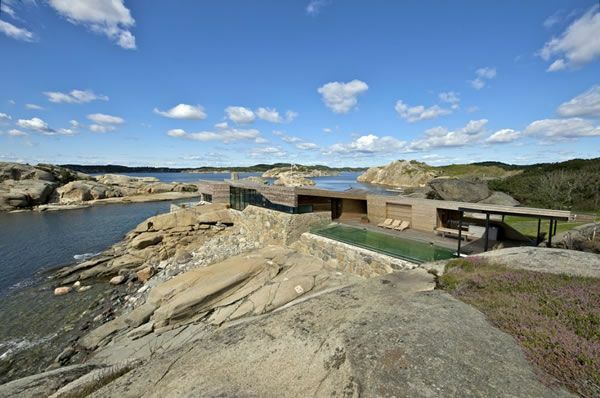 The house blends with the natural site and it creates this uninterrupted flow of surreal beauty. The house has direct access to the beach, which is very nice, especially in summertime when the breeze and the waves are simply delightful. The key to such a welcoming home experience is the relationship between spaces. Due to the open plan composition, almost every room is connected to the exterior or allows views over the spectacular surroundings. Clear lines and neutral colour tones complete the décor. Frameless glass showers, exquisite attention towards the flooring and the impeccable details give you a special feeling of warm and deep relaxation. The terrace, adorned with wood and comfy, smooth white sofas and lounge chairs, offer a unique experience nearby the seashore. The salty breeze and the waves calling you transform this home into an enchanting place. Let yourself inspired and relax. Would you make this your permanent home?